5 Reasons In-Home Sessions are Uniquely You! Family portraits are so important! They provide your family with memories, milestones to look back on, and a legacy to pass on for generations! The trend is to find a a beautiful outdoor location and frolic in the fields. Don’t get me wrong– I love a golden sunset in a field! But, there are more options than that! Your family will look just as gorgeous in your own home as they do anywhere else. In fact, your session might be BETTER because of it! 1. You LOVE your home! It’s not just a house. My husband and I recently moved into a home that was built just for us. We picked the floors, carpet, granite, brick, the siding, garage colors, etc. Our home is ours and we adore it! We spend a lot of time here and have made it our home. My home has portraits that my toddler drew, baby toys, and our favorite couch. It has our bed, and my son’s nursery. All of those things make our home ours. It is personal and unique to us. Your home is unique to you! It is a location no one else can recreate! It is where your children are growing up and creating memories! Your walls are covered in your wedding portraits, family portraits, and art work that you picked specifically for your child! You may have even spent months decorating a new nursery while anticipating a new baby! Those are the details you will look back on with love! One of my favorite things about shooting in clients homes, is how comfortable everyone is, especially the kids. Children love to show me their toys, their bedrooms, and give me a tour of the house before we get started! 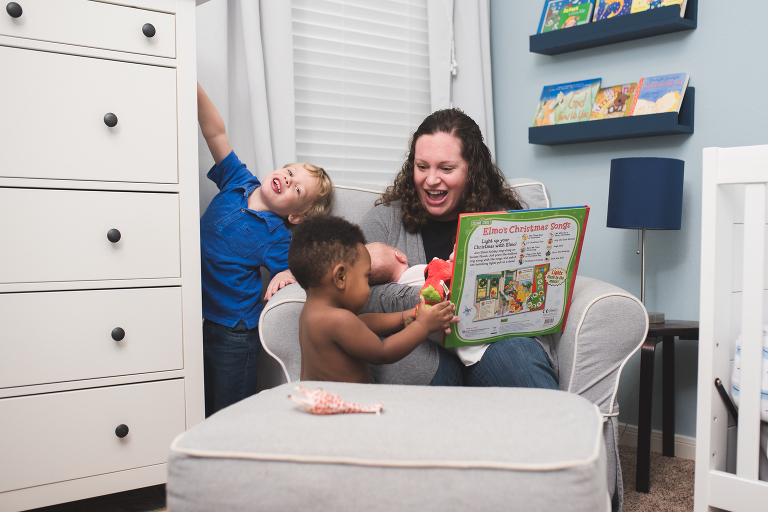 In-home sessions are the best at reflecting your traditions, values, and family lifestyle! When I book in-home sessions, I ask the family to think about things they like to do together, or things that make them smile. Of course, we start each session with the traditional portraits, but the real fun begins when we get a little more candid! Do you like to bake together? Do you make pancakes on Christmas morning? Is there a favorite game you play? Do you have a library full of favorite books to read? 4. It gives your kids something real to look back and remember. Twenty years from now, when your children pull out their old photographs, they will look back and say, “Oh, I loved sliding down that banister!” Or, “My favorite room in the house was the kitchen, because I was always cooking with Mom.” Whatever it may be, your home holds real memories and personality that it adds to your images. Side note: There is a new game out that I’m dying to try! Has anyone tried Kinder Perfect? 5. Everyone is so comfortable, that you might catch something hilarious…. No caption needed for this one. It completely cracked me up! Family game night may Never be the same again! 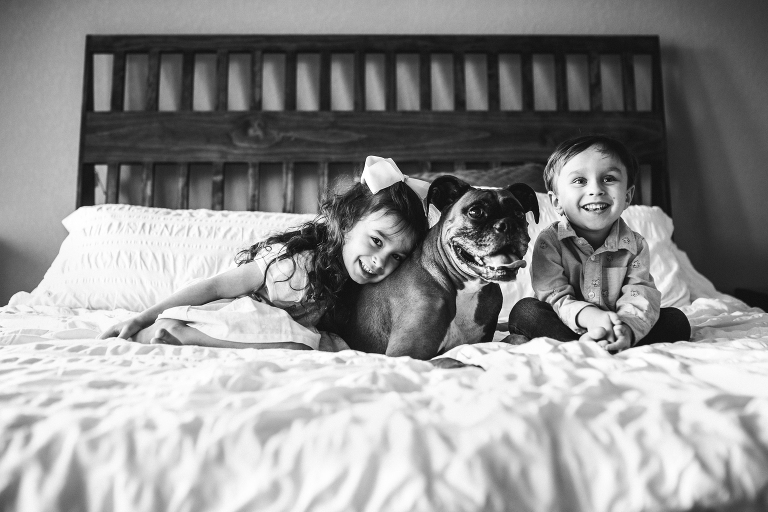 Aimee Hamilton is a Montgomery, TX family photographer specializing in newborn and young family portraits. Aimee Hamilton serves The Woodlands, Magnolia, Tomball, Conroe, Montgomery, Spring, and Cypress, TX. Travel sessions are also available. Want to be the first to hear about Valentine Mini’s? Sign up for VIP treatment here! !